You know how our Canadian neighbors celebrate Thanksgiving six weeks before we do here in these United States of America? Well apparently they do the same with Christmas, because I came home yesterday and found a shoebox full of Canadian sweets in the mailbox, thanks to the divine Mad. I tell you, it made my day. I had a couple of the maple cookies with my bedtime tea last night, my husband devoured a box of Smarties and found himself transported back to England as a five year old, I ate the Coffee Crisp with my coffee this morning (breakfast of champions?) and I'm looking forward to the Chicken Bones. Candy called Chicken Bones? Bestill my heart. Thank you, oh sweet and fair Canadian for spreading social justice, erudition in children's literature and treats throughout the blogosphere. 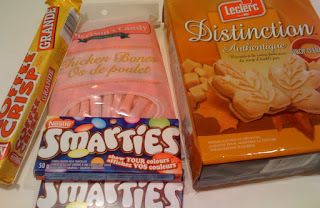 That's too funny -- I just sent a huge box of American sweets and junk to my dear Canadian friend, stuff she can't get there. Crunchie bars and Hob Nobs are my favorite English treats! It's too early for Xmas! Unless you are one of those people who takes down their Halloween lights on Nov. 1st and puts up their Christmas tree on Nov. 2nd. Like my neighbor. Who is crazy. And I won't those Smarties! You got cake for 2nd breakfast, after all. That Mad is a fine woman, isn't she? Chicken Bones.. hmm... are those anything like Chick O Stix? those maple leaf cookies are an addiction. I can, but don't, buy those here. I tagged you. I know, I know. I already feel guilty about it. But there it is. I was under extreme pressure from The Big Kids. I promise I'll do better in the future. I love smarties! The Coffee Crisp looks like something that I should be having with my morning coffee too. I think I need to find a Canadian friend. those canucks are pretty awesome, aren't they? So very glad you enjoyed them. Can you guys mail some winter weather to make my Christmas merry? Can you mail plane tickets to I can travel there? Coffee Crisp and coffee IS the breakfast of champions. YUM! I love Canadians and Canadian candy. My daughters love Smarties, they swear they are better than m&m's. Those Maple Cookies are our national treasure I swear. And I guarantee you that Mad is as sweet in person as those cookies. HA! I was getting all excited and sweaty thinking there was a holdiay I was missing out on. It's the holiday of sarcasm. Just took me a minute to figure that out. But for sure and for certain we rock your as' with our junk food, you skinny pansy Americans! Ya, ya, take that with my WonderBar!